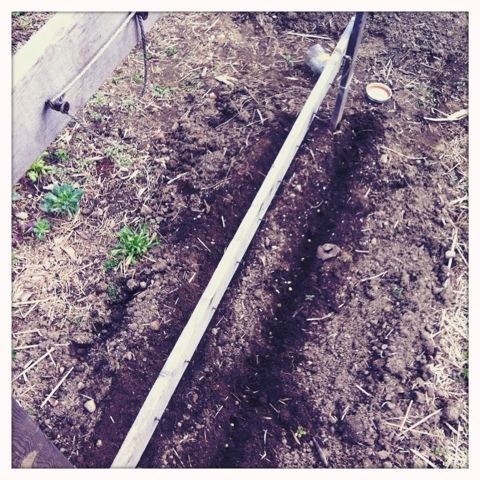 St. Patrick’s Day is the traditional pea sowing time in the Northeast, though usually there’s a pretty good chance that the garden is still buried in snow this time of year. Lately the weather has felt like late May and the garden is ready to go. This year I’m growing two kinds of regular green shelling peas, Green Arrow and Laxton’s Progress No. 9, plus Sugar Snap and Blue Podded Shelling Pea. This last one was a last minute addition. When I went to the garden center on Saturday, I couldn’t resist browsing the seed racks and ended up picking up a couple more packets, even though I already have too many seeds. It’s a soup pea rather than a fresh-eating pea. I’m looking forward to making pea soup from homegrown peas next winter! 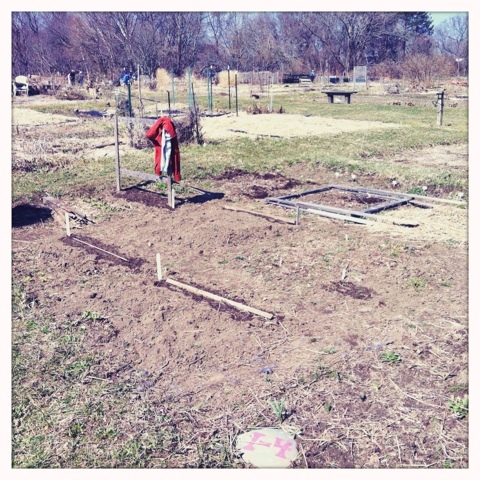 Saturday I worked some composted cow manure into a few of the beds and then put my peas in little jars of water to soak over night. This will give them a bit of a jump start so that they will germinate faster. Sunday morning drained off the excess water and sprinkled each jar of peas with a little bit of inoculant. This black powder inoculates the peas with a special bacteria that helps the pea plants capture nitrogen from the atmosphere and fix it in the soil and can greatly increase your yield. Don’t ask me how it works. I planted a double row of each kind. I’ll put a trellis down the middle so they can grow up both sides. 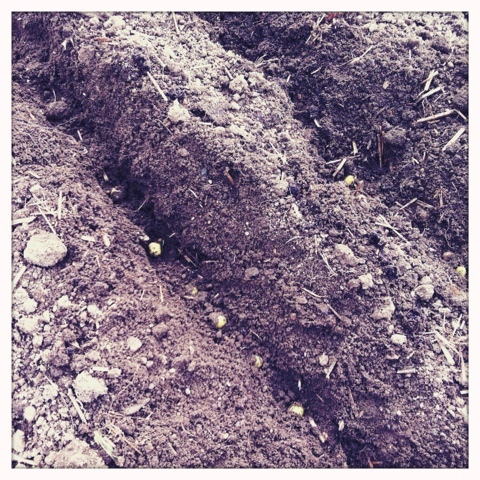 Since the peas are an early crop, I’ll plant my tomatoes along side. By the time the tomatoes are getting big, the peas will be finished and the tomatoes will be able to take over the trellises. Have you planted anything yet? Posted on March 19, 2012 by kate. 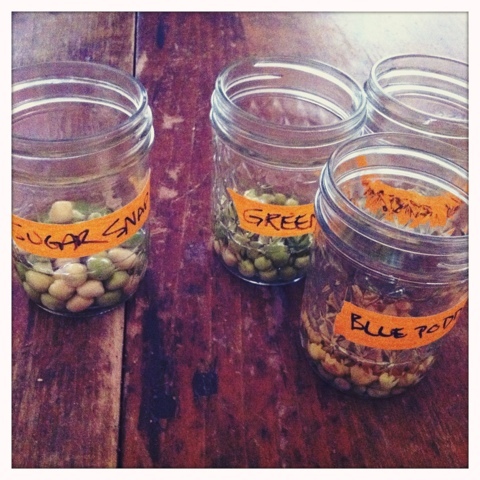 This entry was posted in Gardening and tagged food, gardening, Peas, seeds, shelling pea, soup pea, sowing, spring, sugar snap pea. Bookmark the permalink. I’d never thought of growing peas for soup making. Cool idea! Hello and thanks for finding my blog. It gave me the chance to visit your site. Your garden layout looks amazing. I’m looking forward to seeing it as the season progresses. By the way, you may want to register your blog at Blotanical — it’s a search engine of garden blogs. Cheers! Thanks, Kevin! I’ll have to check out Blotanical. I love the idea of following peas with tomatoes – I have been trying to find more space for my tomatoes. Have you done this successfully before? What re your frost free dates? Thanks! I haven’t tried it before, but I think it should work for me because by the time the tomato plants are starting to get big, the peas will be winding down. My frost free dates are Mid-May to the end of September (or sometimes a week or two into October if we’re lucky.) I plant my tomatoes around Memorial Day. Thanks! I look forward to hearing how it works out for you. My frost-free summer is shorter, but I might try this next year – I’ll watch my pea and tomato timing this year and see.